Full Instructor Jeet Kune Do/Filipino Martial Arts!! Black Belt Brazilian Jiu Jitsu!! Gary Herman has been training since 1986, group, private and seminar Instruction available. Mixed Martial Arts - Concepts and training methods are street effective and battle-proven. Jeet kune do is one of the most effective, usable, and renowned fighting systems in the world. Not held back by tradition, and totally geared for exploration and expansion this art is a beautiful tool for personal development. If you are looking to develop physically, mentally, emotionally this is a great vehicle. You will learn the concepts, techniques, training and fighting methods. This is a stand-up, empty hand streetfighting art. Kicking, punching, close quarter trapping (Head butts, elbows, knees, joint manipulation and controlling positions etc.) and takedowns for ground fighting incorporates the numerous arts. Filipino Martial Arts/Kali - Specialized and improvised impact and bladed weapon craft. Filipino Kali covers single and double sticks, knife, stick and knife (espada daga), long blade and other variations. Weapons bring out the best in your physical training by turbo charging your attributes. You will learn how to effectively neutralize blunt and edged weapon assaults. Brazilian Jiu-Jitsu is the precise art of positional dominance, chokes, arm bars, leg locks and reversals. You will learn how to control, dominate and subdue an assailant who is much larger, stronger and faster than you are! Ground fighting is rapidly becoming the most sought after martial art in the world; if you end up on the ground Brazilian Jiu-Jitsu has the answers. #104 - 938 Brunette Ave.
Group classes available Monday to Saturday, morning, afternoon and evening!! Would you like more information on hours, classes and programs available at Tactical Fighting Martial Arts? Please contact the school with your questions. Update the details, Write a Review or Report Error of Tactical Fighting Martial Arts. This Chart shows the Martial Arts Styles offered most in Coquitlam, Canada area. 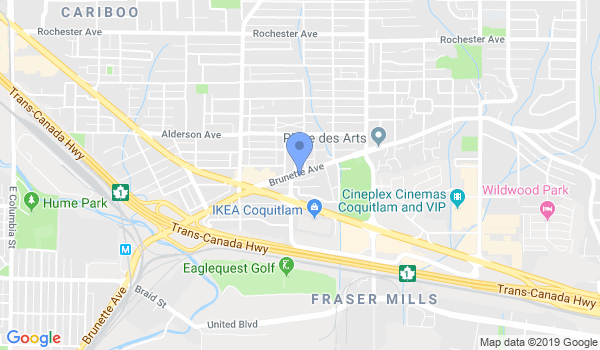 View a list of Dojo in Coquitlam, or enter your address below to find schools closest to you.